If you had asked me to describe a new snack that my 9 year old would enjoy, the same child whom, over the years, has said no to just about everything, the words "raw," "vegan," and "gluten-free" would not have been in my vocabulary. We were visiting a friend in Maine over the weekend. She's a painter, and a raw food enthusiast who has created a home business selling raw, vegan, and organic snacks. Elizabeth went to high school with my husband and ended up in Maine, learned how to paint, and started selling her artwork. Her incredible talent and energy comes through every painting she does. We have bought at least 10 paintings over the years and this most recent one we were picking up was a commissioned work for my boss, who retired last week. Well, we showed up at her house and the kids were hungry. She had her raw food wares on a table, ready for sale. The next thing I know, the 9 year old has opened up a box of the Go Bananas cookies and was chowing down. And LOVED it. The 12 year old also ate some and, between the two of them, 6 cookies were gone in about 5 minutes. Then they got to work on the fruit leathers and 2 of those were gone in a heartbeat. Needless to say, the 9 year old didn't eat a whole lot of lunch, but even that was a vegan crepe with flax seeds and it went over well. Before we left for home, I purchased another box of cookies, some kale chips (I like the mustard ones best), blueberry gRAWnola and a healthy supply of fruit leather. Now, my diet is about as far from a raw food vegan diet as one can get. And, I was under the impression that it was a lot of work. Elizabeth convinced me otherwise, but it is mighty helpful to have a dehydrator and a food processor. I have neither of these things, at the moment. 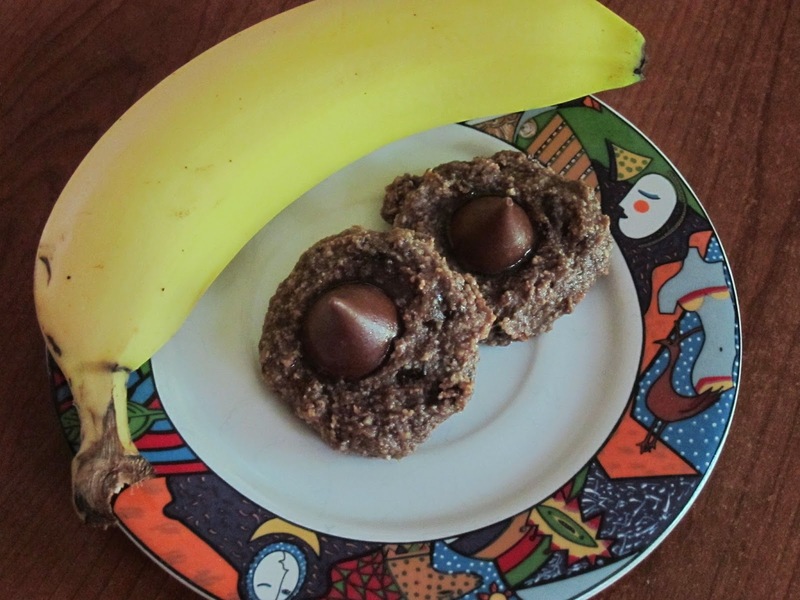 But, given how much the 9 year old liked those cookies, and how much I want that 9 year old to eat good food, and how healthy those cookies are, I decided to try our own version. I took this recipe I found online, doubled it, and instead of almonds I used half pecans and half cashews. As, I mentioned, I don't have a food processor, so the blending part was fairly difficult and likely took longer than it should have. Dehydrating is also taking longer than it should have, since I'm using my oven. I had them in a warm oven until I went to bed and then turned it off but left them in there. This morning I have the oven on again, then will turn it off again when I leave and keep the cookies in there until I get home. They are sticky. But they look like cookies. 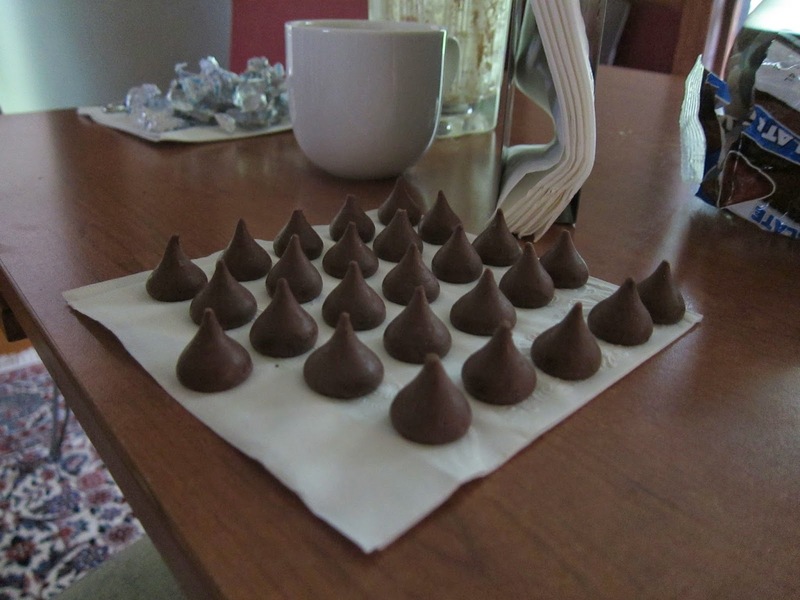 I set the 9 year old to unwrapping chocolate kisses and putting them in the middles of the cookies - we used the kisses to spread the batter flatter before we set the kiss in the middle. Now I'm wondering, will this kid of mine be moving even more in this direction? Am I going to have to learn to prepare more vegan entrees? I will note that the kale chips were not a favorite, so maybe we're just going to have to pick and choose.